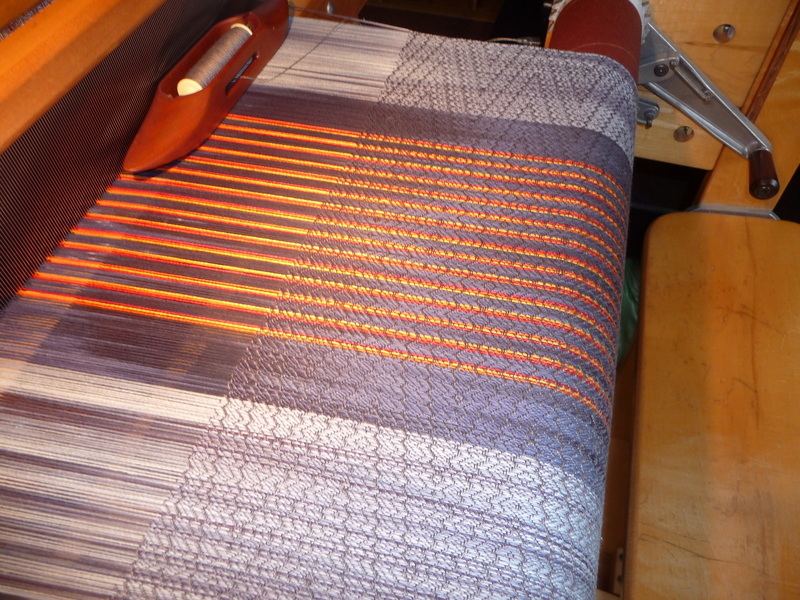 A week ago, I said here (confidently) that the rest of the process of getting the Midwinter Fire warp onto the loom and ready to weave was going to be on the order of a piece of cake. Hah!! The first stage — pulling all 485 threads through the spaces in the reed (like a stainless steel comb, designed to space the threads evenly across the width) — went just fine. 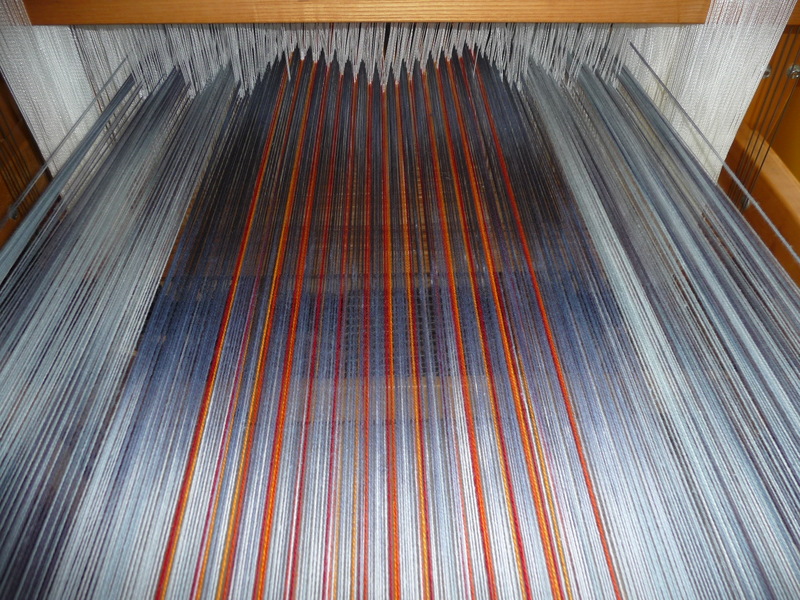 The second stage — carefully threading each warp thread, one by one, through a heddle (those white polyester thingies with an eye in the middle) in a particular complex sequence designed by you-know-who — went quite slowly but in the end perfectly. And I use that word judiciously always; it’s likely to come back to haunt me. In this case, it’s accurate, as was my threading. 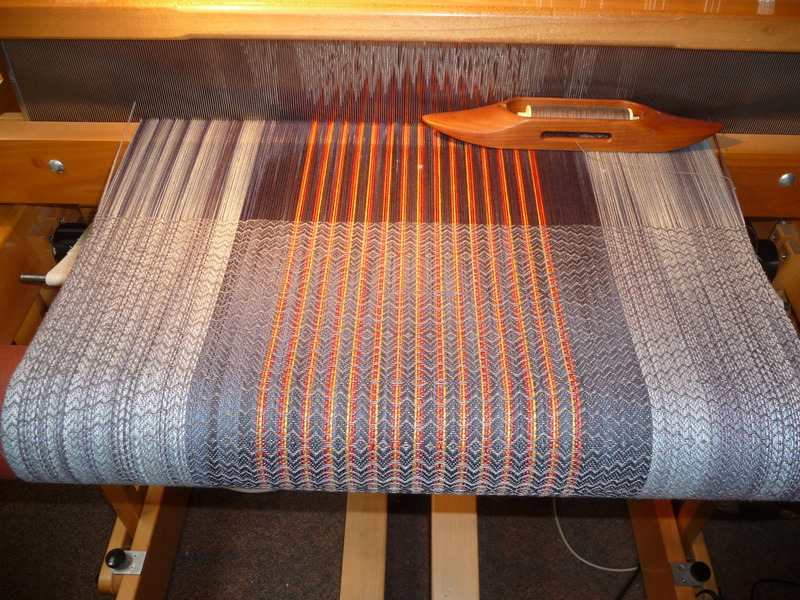 What surprised me was the process of winding the entire seven-and-a-half-yard-long warp from the front of the loom to the back onto the warp beam. I expected it to go quite smoothly and quickly, but was unpleasantly surprised early on when the center section — the background for the bright accent threads — kept tangling. Said tangling got worse and worse the farther I went. It was awful, really awful. 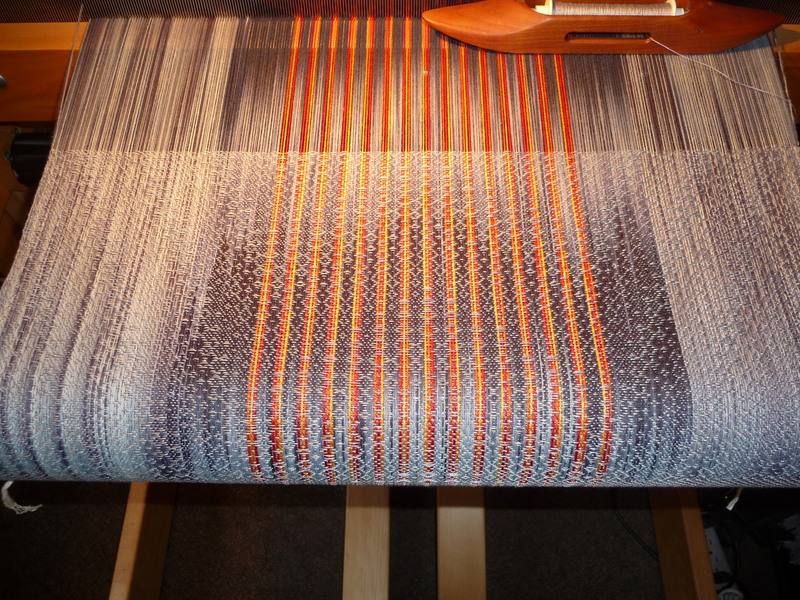 I actually toyed with the thought of cutting the whole dang thing off the loom and pitching it out, but better sense prevailed. As did a deep well of patience I wasn’t aware I had access to. 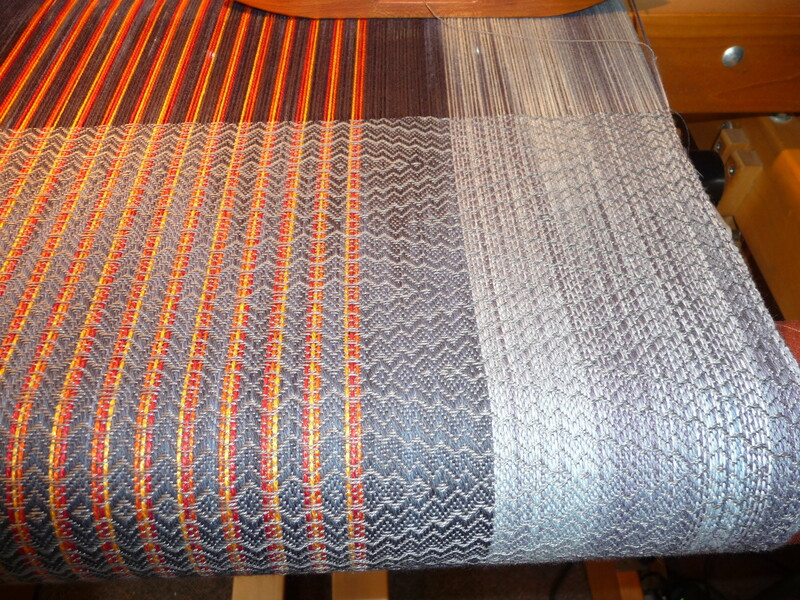 It took many hours, spread over two days, but my persistence in the end gave me one of the most beautiful and carefully arranged warps I’ve ever created. It still feels something like a triumph over the forces of darkness. 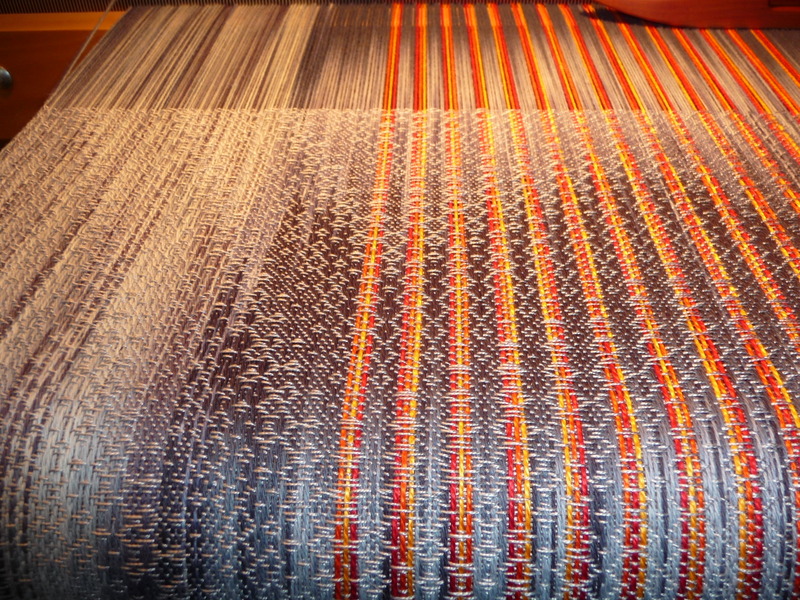 You can see the slightly random arrangement of the red, orange, and yellow-orange accent threads. 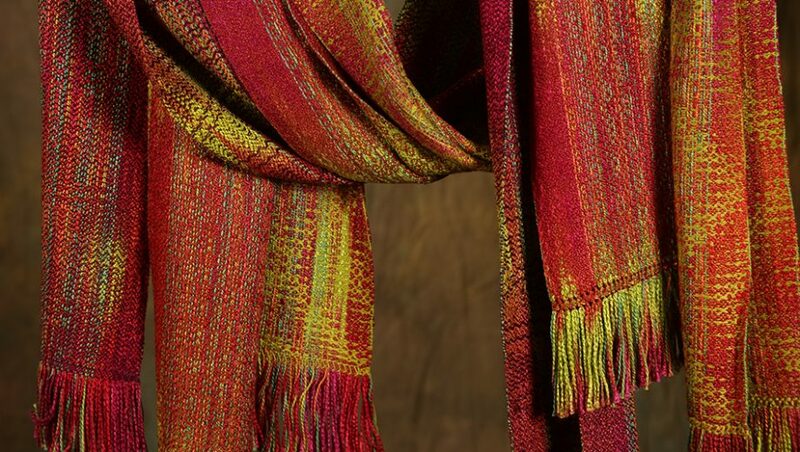 They purely glow against the soft grey tones throughout the length of the weaving. I am very pleased indeed. OMG, I’m speechless both with your patience and the resulting beauty! Ooh, ooh, ooh! I saw that ferocious tangle, and the result of your patience is a Midwinter Fire warm enough to melt the snows of a thousand winters to come. Global warming, anyone?